The golf course at Hilton Templepatrick was designed by David Jones, under the influence of David Feherty, and is a genuine championship challenge at over 7,000 yards off the back tees. Host course for the Darren Clarke Golf School. The modern hotel at Hilton Templepatrick offers comfortable accommodation to guests, and is situated ideally within the beautiful Castle Upton Estate. Visitors can choose from the more than adequate standard rooms, family rooms, or splash out on a deluxe room or suite. 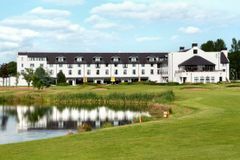 The hotel and facilities on-site at Templepatrick make it a complete resort, with everything you could want on the doorstep, an as such is the ideal destination for a golf break. If the golf course is not enough, the excellent leisure facilities ensure there is always something to do here. The Livingwell Health Club has a heated indoor pool, well-equipped gym, jacuzzi and a sauna, while appointments can be made for massages and various beauty treatments. The resort also has two outdoor tennis courts. Treffner's Restaurant has an excellent menu, including classics like Irish beef, and locally-caught monkfish. Enjoy live music in the lounge bar on Saturday nights.